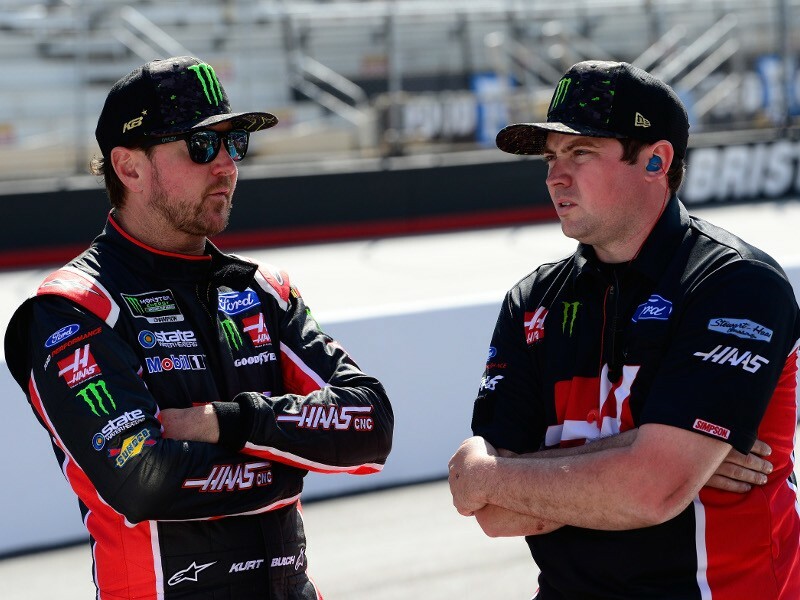 BRISTOL, Tenn. - Kurt Busch was a mere .002 seconds behind Kyle Busch in Friday’s Monster Energy NASCAR Cup Series qualifying at Bristol Motor Speedway. On Saturday, however, a wall came between the brothers, who no longer will start side-by-side on the front row for Sunday’s Food City 500. Up until the final 10 minutes of final practice, the weekend had gone nearly perfectly for Kurt Busch, who was set to be part of a 1-2 start with his pole-winning brother for the third time. Then, suddenly, it all fell apart. Busch was fourth fastest in Happy Hour, but on his 70th lap of the session, his No. 41 Stewart-Haas Racing Ford lost traction in turn 2, spun sideways, slid down the backstretch and nosed into the inside SAFER barrier near the entrance to turn 3. With damage too severe to repair, Busch will be forced to start Sunday’s race in a backup car. That also means dropping to the rear of the field before the green flag. After exiting the car, Busch provided a post-mortem. “I had 45 laps on the tires and was trying to get to 50, Busch explained. “The setup changes dramatically with air-pressure builds and the VHT (traction compound) changing, so I was just trying to do as much research as I could. Crew chief Billy Scott was busy harvesting items to transfer from the primary car to the backup. Michael McDowell may not have qualified on the front row – the Busch brothers did that – but his ninth-place effort during Friday’s time trials at Bristol Motor Speedway meant the world to Front Row Racing. The addition of McDowell to an organization that already included two-time Monster Energy NASCAR Cup Series winner David Ragan seems to have formed a critical mass that is evident in the team’s performance. When McDowell takes the green flag in Sunday’s Food City 500, he’ll be well within sight of the leaders. McDowell’s ninth-place qualifying run is a personal best at Bristol and the best-ever for Front Row. “I was thinking about that (Friday), about what it means to an organization like ours, a smaller organization,” McDowell said after Saturday’s first practice at Thunder Valley. “It’s not just a confidence-builder. It gives you life inside the competitive side of things. It gives you hope, and it gives you a sense of accomplishment and gratification… and that there will be moments where you can capitalize. Another such moment occurred on Saturday, when Ragan, who had qualified 23rd, topped the speed chart in final practice. Kurt Busch’s wreck wasn’t the only issue for Stewart-Haas Racing. Kevin Harvick, who had to go to a backup car after crashing in opening practice on Friday, struggled through two practice sessions on Saturday, running 16th in the morning and 24th in Happy Hour. SHR teammate Clint Bowyer tangled with the No. 6 Ford of Trevor Bayne with roughly 10 minutes left in final practice, damaging the left front of his No. 14 Ford, but not severely enough to require a backup car. In cooler temperatures on Saturday morning, Kyle Larson led the day’s first practice session at 129.004 mph, which exceeded Kyle Busch’s pole-winning speed of 128.822 mph from Friday afternoon. Larson then spent most of final practice trying to rubber-in the top lane, where he prefers to run. Martin Truex, Jr., who qualified 26th, was second fastest in Saturday’s first practice at 128.952 mph. David Ragan paced final practice at 127.487 mph, followed by Chase Elliott and Denny Hamlin. WDUN will carry live PRN Radio coverage of Sunday's Monster Energy NASCAR Cup Series Food City 500 at Bristol Motor Speedway beginning at 12 pm on 102.9 FM, at 1 pm on AM 550 and streaming live on AccessWDUN. 1. (18) Kyle Busch, Toyota, 128.822 mph. 2. (41) Kurt Busch, Ford, 128.804 mph. 3. (2) Brad Keselowski, Ford, 128.262 mph. 4. (17) Ricky Stenhouse, Jr., Ford, 128.253 mph. 5. (12) Ryan Blaney, Ford, 128.185 mph. 6. (42) Kyle Larson, Chevrolet, 128.048 mph. 7. (21) Paul Menard, Ford, 127.980 mph. 8. (88) Alex Bowman, Chevrolet, 127.835 mph. 9. (34) Michael McDowell, Ford, 127.673 mph. 10. (22) Joey Logano, Ford, 127.571 mph. 11. (24) William Byron #, Chevrolet, 127.470 mph. 12. (19) Daniel Suarez, Toyota, 126.628 mph. 13. (20) Erik Jones, Toyota, 127.317 mph. 14. (14) Clint Bowyer, Ford, 127.191 mph. 15. (95) Kasey Kahne, Chevrolet, 127.115 mph. 16. (9) Chase Elliott, Chevrolet, 127.031 mph. 17. (48) Jimmie Johnson, Chevrolet, 126.972 mph. 18. (47) A.J. Allmendinger, Chevrolet, 126.771 mph. 19. (10) Aric Almirola, Ford, 126.704 mph. 20. (43) Darrell Wallace, Jr. #, Chevrolet, 126.420 mph. 21. (3) Austin Dillon, Chevrolet, 126.395 mph. 22. (37) Chris Buescher, Chevrolet, 126.270 mph. 23. (38) David Ragan, Ford, 126.204 mph. 24. (32) Matt DiBenedetto, Ford, 125.535 mph. 25. (11) Denny Hamlin, Toyota, 125.773 mph. 26. (78) Martin Truex Jr., Toyota, 125.765 mph. 27. (15) Ross Chastain(i), Chevrolet, 125.248 mph. 28. (23) Gray Gaulding, Toyota, 124.938 mph. 29. (00) Landon Cassill, Chevrolet, 124.922 mph. 30. (31) Ryan Newman, Chevrolet, 124.735 mph. 31. (1) Jamie McMurray, Chevrolet, 124.517 mph. 32. (13) Ty Dillon, Chevrolet, 123.978 mph. 33. (6) Trevor Bayne, Ford, 123.802 mph. 34. (72) Corey LaJoie, Chevrolet, 121.790 mph. 35. (96) D.J. Kennington, Toyota, 121.389 mph. 36. (55) Reed Sorenson, Chevrolet, 121.366 mph. 37. (51) Harrison Rhodes, Chevrolet, 118.058 mph. 38. (66) Chad Finchum(i), Toyota, 114.658 mph. 39. (4) Kevin Harvick, Ford, 0.000 mph. Kurt Busch (left) talks with a crew member during practice for Sunday's Monster Energy NASCAR Cup Series race at Bristol Motor Speedway.